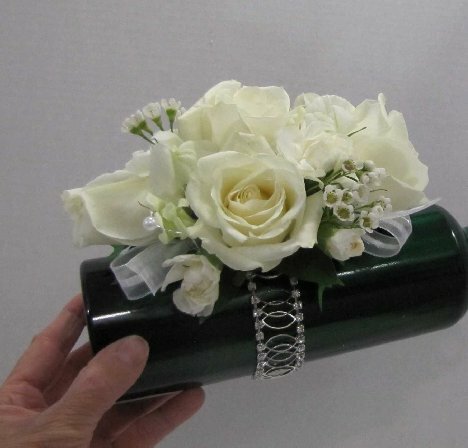 Your final corsage design should fit snugly against the wrist and look complete from all sides. Elongating the design into an oval shape usually looks better on the wrist than a large rounded design. Remember to scale your flowers to the size of the person wearing them. This is an important note when taking your order from the bride. 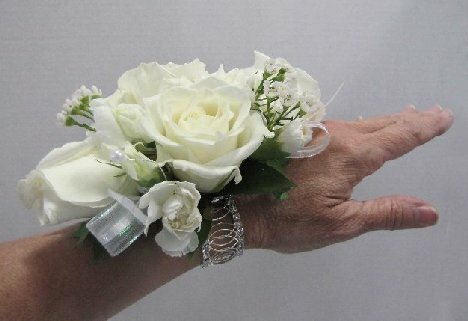 Too small of a corsage on a large woman can look just as awkward as an overbearingly large wristlet is on a small flower girl. The elements all come together beautifully, combining a lovely mix of flowers and textures in one design. The top view shows that the shapes and insertions are staggered, meaning that the flowers aren't all the same height. Try to avoid a perfect "roundy moundy" that can look rather like a tennis ball on someone's wrist. The shape is also perfect for pinning if the wearer elects not to wear it on her wrist. Be sure to carry small wire cutters in case a grandmother balks at wearing a wristlet. You can cut it off the bracelet with a few snips and retain the acrylic square. 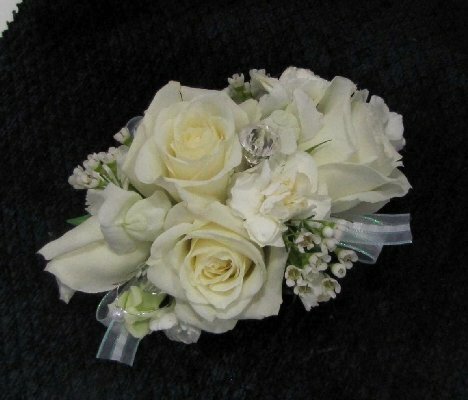 Always have a few extra corsage pins on hand for pinning to a shoulder if needed. 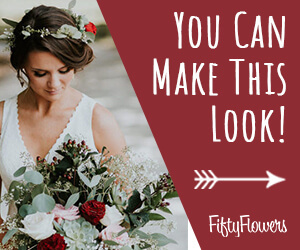 Be sure to check out my other flower tutorials, including matching boutonnieres for the groom, groomsmen, fathers, brothers and other men in the wedding party. 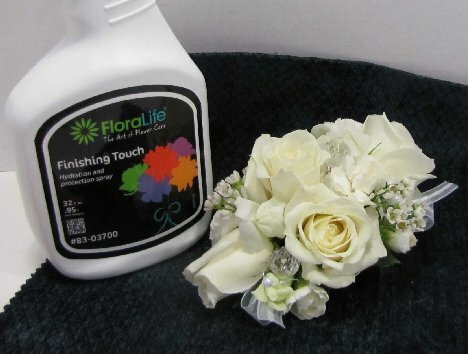 Don't forget to mist with a flower sealant such as Finishing Touch. 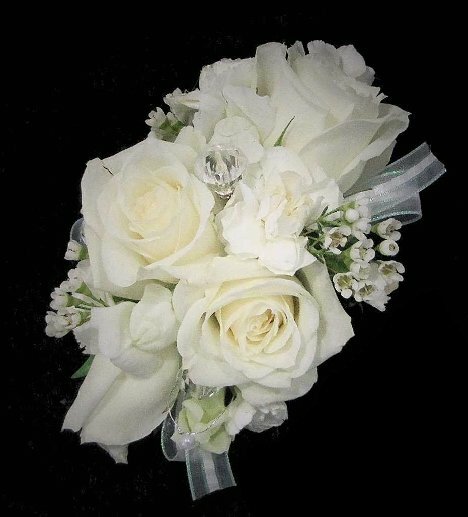 This extends the life of your corsages by slowing down moisture evaporation from the petals. Keep in mind that professional florist coolers put humidity into the air. Household refrigerators and air conditioning units are designs to take moisture OUT of the air - and will pull the moisture out of your flowers at the same time. It's important to prevent this by misting it with a flower sealant. 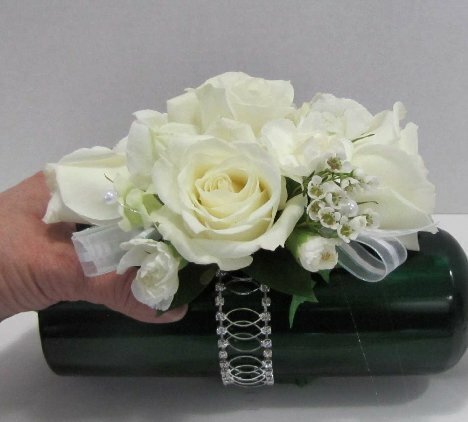 The final corsage is beautiful and dainty and would work well in shades of pink, yellow, blue, orange and greens! 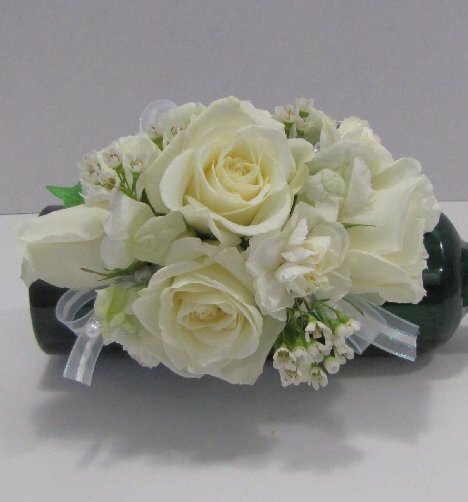 Check out all the flowers available on my wedding store!